Ever since comedian Hari Kondabolu wrote and starred in the Tru TV special, The Problem with Apu. In it, Hari talks about how Apu was the only Indian on TV when he was growing up. He slowly realized that Apu was not the person he believed should represent his culture. Hari did think Apu was funny, yet not accurate or righteous. “It gets to the insidiousness of racism”Hari Kondaolu “because you don’t even notice it when it’s right in front of you”. A number of events happen in this 49-minute film, including South-Asian Americans explain how people called them Apu and wanted them to say his catchphrases, and how most of their career was centered around this person that didn’t even exist. Hari also compares a white man playing an Indian shopkeeper to Blackface, which African-American actress Whoopi Goldberg agreed with. Hari says that while he’s glad that Apu brings more culture on television, the Indian shopkeeper doesn’t go well with people like Kal Penn, saying that the character ruined the show for him. Since, many have been wanting to remove Apu from The Simpsons, saying he’s an unfair representative for the Indian culture. So the question is raging: is Apu racist? I don’t think Apu is racist. In the documentary, ‘The Problem with Apu’ it shows that children are being bullied because of the character — that’s awful that children are being bullied because of Apu, but I don’t that means Apu himself is racist. To truly see if a character is a racist, we need to find his/her backstory. According to The Simpsons, Apu was born in India and wanted to get a higher education and job so he moved to America. While studying for a P.H.D in computer science, Apu paid off his student loans via working at a supermarket and enjoyed the people so much he decided to work there. After graduating with a P.H.D, Mayor Quimby proposed to remove all illegal aliens. Apu, wanting to stay a U.S citizen, bought an illegal birth certificate, saying his parents were U.S citizens. 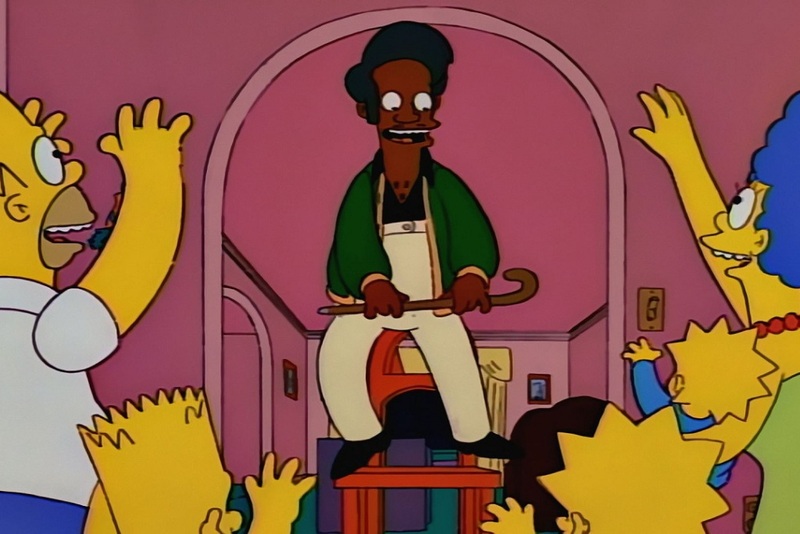 Although Apu felt awful for doing this, and legally became a citizen instead of illegally lying about his origins. He loves Springfield so much, he volunteers at the fire department just for fun. With this, I find Apu to be a dedicated man who’s both intelligent and loyal to his friends and country. A major argument that has come up time and time again, is that Apu is voiced by a white person. I honestly think that this being one main argument is absurd. 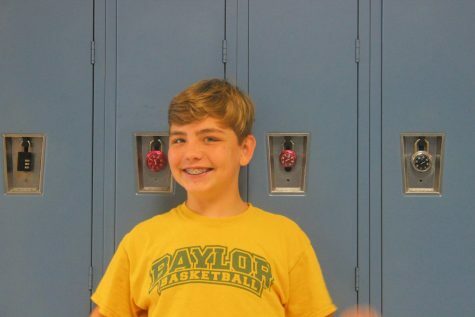 It’s a cartoon character! Anyone can voice anyone, and The Simpsons aren’t going to by a new voice actor for only one character. Even Samari Jack, a popular TV show in the early 21st century, featured a Japanese warrior voiced by a black man. And besides, a cartoon character is distinct by their looks, and voice. Without those, you don’t have a character. The last main argument is Apu’s voice. While yes, I do think it’s stereotypical, the last paragraph is still valid. A big thing about a cartoon character is their voice. Everyone has a funny voice in the Simpsons, like Moe the bartender, Flanders the Christian neighbor, Mr. Burns the greedy rich elder, and Homer Simpson. In fact, I believe that Apu is far from the most offensive person on the show. To me, it’s the big star himself, Homer Simpson. This idea of a regular house dad is mean, gluttonous, abusive, and careless. Apu is nowhere on these levels of Homer, where Apu is so friendly he’s best friends with John Lenon. 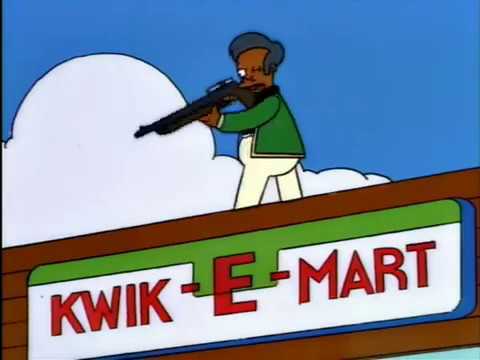 Apu threatening customers while his store is closed. If you have been bullied because you are Indian heritage and related to Apu, I believe you have every right to hate him. People hate other things for other reasons. Apu is very stereotypical on some Indian residence, like working at a convenience store, his outfit, he’s vegan, even the voice he uses when he talks. He’s a blank slate of what someone from his heritage is, and at a time where this man represented the Indian culture, this can be offensive.